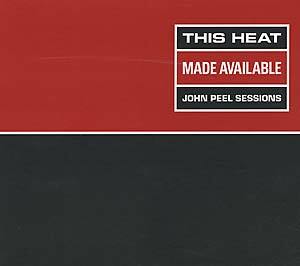 "This Heat's earliest public recordings came from two sessions for John Peel's BBC radio show, in April and October of 1977. Peel was one of their greatest enthusiasts at the time, hearing excellence in the band's mixed repertoire of post-Krautrock songs and uniquely approached improvisation. Of special merit here is the band's maverick use of real-time tape loops to augment their basic three-piece sound, as well as their choice of pre-recorded noises; both helped to create the pioneering effects later honed on their first two official releases. From the classic, Blue & Yellow record, we are treated to alternative versions of 'Horizontal Hold' (where the guitar strumming and drum-work resemble helicopter blades slicing effortlessly thru stormclouds ! ), 'Not Waving' and 'The Fall of Saigon.' 'Makeshift Swahili,' from the band's second full-length release, also appears here, with a radically different sound structure, though the composition runs essentially the same. Plus, we are treated to four tracks of This Heat's ground-breaking ensemble work as electro-acoustic improvisers, which can be found nowhere else: 'Rimp Romp Ramp,' 'Sitting,' 'Basement Boy' and 'Slither.'"